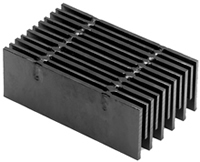 Most popular and economical choice of bar grating, bearing bars and cross rods are electroforged into one through use of hydraulic pressure and heat fusion. Bearing bars and cross rods are hydraulically pressed together by cross rod deformation without welds or rivets to form a permanent bond. The permanent bond is achieved by slotting the bearing bars with a wider ‘dovetail’ shape at the bottom of the slot, thus locking in the cross rod when hydraulically pressed together. Square cross rods are swaged through punched diamond shaped holes in rectangular bearing bars. 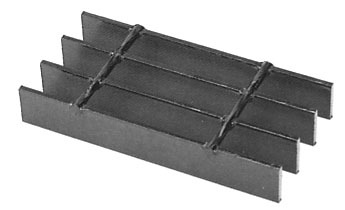 Provides lower cost alternative to press-locked grating with the same strength. Swage-locking does not provide a cross rod flush with the walking surface. 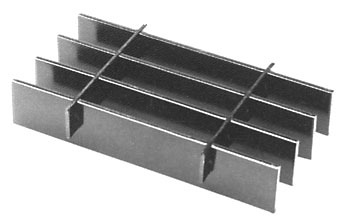 A type of press-locked grating in which cross rods are flush with the walking surface. Bearing Bars are thicker at top and bottom to provide similar strength to rectangular bar but with lighter weight. Cross rods are swage-locked. The striated top and bottom flanges provide a “built-in” skid resistance without serration. This product is the lightest weight aluminum grating alternative.